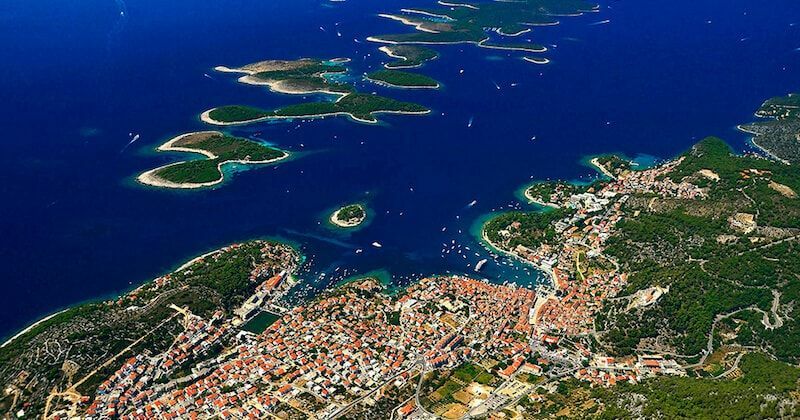 Home Destinations Croatia What need to know about Hvar town! 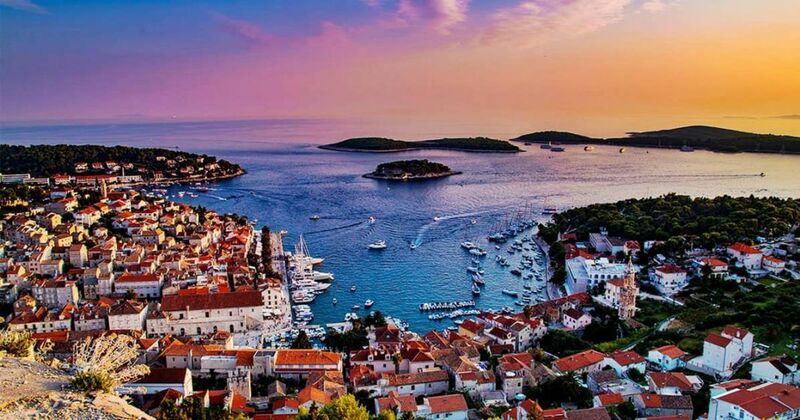 The island’s hub and busiest destination, Hvar Town is estimated to draw around 20,000 people a day in the high season. It’s odd that they can all fit in the small bay town, where 13th-century walls surround beautifully ornamented Gothic palaces and traffic-free marble streets, but fit they do. Visitors wander along the main square, explore the sights on the winding stone streets, swim on the numerous beaches or pop off to the Pakleni Islands to get into their birthday suits, but most of all they party at night. The main street is the long seaside prom- enade, dotted with small, rocky beaches, sights, hotels, bars and some restaurants. The town square is called Trg Svetog Stjepana and the bus stop is minutes away from here. On the northern slope above the square, and within the old ramparts, are the remains of several palaces that belonged to the Hvar aristocracy. From the bus station to the harbour the town is closed to traffic, which preserves the medieval tranquillity. Hvar is such a small, manageable town that it only recently got street names, although nobody really uses them. St Stephen’s Square (Trg Svetog Stjepana) The centre of town is this rectangular square, which was formed by filling in an inlet that once stretched out from the bay. At 4500 sq metres, it’s one of the largest old squares in Dalmatia. The town first developed in the 13th century to the north of the square and later spread south in the 15th century. Notice the well at the square’s northern end, which was built in 1520 and has a wrought-iron grill dating from 1780. Franciscan Monastery & Museum (admission 25KN; h 9am-1pm & 5-7pm Mon-Sat) This 15th-century monastery overlooks a shady cove. The elegant bell tower was built in the 16th century by a well-known family of stonemasons from Korčula. The Renaissance cloister leads to a refectory containing lace, coins, nautical charts and valuable documents, such as an edition of Ptolemy’s Atlas, printed in 1524. Your eye will immediately be struck by The Last Supper, an 8m by 2.5m work by the Venetian Matteo Ingoli dating from the end of the 16th century. The cypress in the cloister garden is said to be more than 300 years old. The adjoining church, named Our Lady of Charity, contains more fine paintings such as the three polyptychs created by Francesco da Santacroce in 1583, which represent the summit of this painter’s work. Fortica (admission 25KN; h 9am-9pm) Through the net- work of tiny streets northwest of St Stephen’s Square, climb up through a park to the citadel built on the site of a medieval castle to defend the town from the Turks. The Venetians strengthened it in 1557 and then the Austrians renovated it in the 19th century by adding barracks. Inside is a tiny collection of ancient amphorae recovered from the sea- bed. The view over the harbour is magnificent, and there’s a lovely cafe at the top. Arsenal once served as a repair and refitting station for war galleons. Renaissance Theatre (Trg Svetog Stjepana; admission 15KN; h 8am-2pm & 3-9pm) Built in 1612, this theatre is reportedly the first theatre in Europe open to plebeians and aristocrats alike. It remained a regional cultural centre throughout the centuries. Plays were still staged here right up until 2008. Although much of the theatre is still under renovation, you can wander around the atmospheric interior and take in the faded frescoes and baroque loggias. Cathedral of St Stephen (Katedrala Svetog Stjepana; Trg Svetog Stjepana; admission 10KN; h9am-1pm & 5-9pm) The cathedral forms a stunning backdrop to the square. The bell tower rises four levels, each more elaborate than the last. The cathedral was built in the 16th and 17th centuries at the height of the Dalmatian Renaissance on the site of a cathedral destroyed by the Turks. Parts of the older cathedral are visible in the nave and in the carved 15th-century choir stalls. Bishop’s Treasury (Riznica; admission 10KN; h 9am-noon & 5-7pm Mon-Fri, 9am-noon Sat) Adjoining the Cathedral of St Stephen, the treasury houses silver vessels, embroidered Mass robes, numerous Madonnas, a couple of 13th-century icons and an elaborately carved sarcophagus. Benedictine Monastery (admission 10KN; h 9am-noon & 5-7pm Mon-Sat) Northwest of St Stephen’s Square, this monastery has a re-creation of a Renaissance house and a collection of lace painstakingly woven by the nuns from dried agave leaves. There are several diving outfits in town, including Marinesa Dive Centre (091 515 7229) and Diving Centre Viking. Both offer PADI certification courses and dives (from 250KN and up to 500KN for a full-day trip with two dives). You can rent scooters at Navigare (021- 718 721; www.renthvar.com; Trg Svetog Stjepana) for between 200KN and 250KN per day. 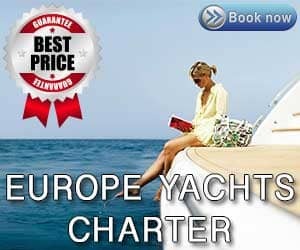 They also rent cars (from 450KN per day) and boats (from 400KN per day). 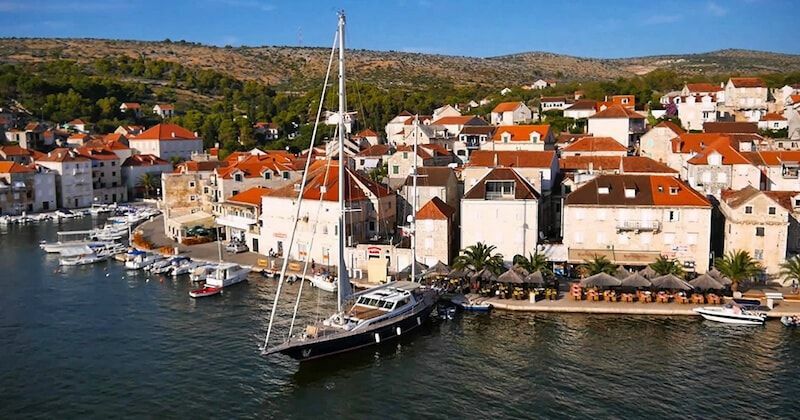 There are coves around the hotels Amfora and Dalmacija for swimming, as well as the fancy Bonj Les Bains beach run by Sunčani Hvar Hotels, with stone beach cabanas for open-air massages and expensive lounge chairs (650KN per day for two chairs). A popular boat excursion (40KN, 20 min- utes) is to Mekićevica bay on the south side of the island, where there’s a great beach- front restaurant called Robinson. Taxi boats also run to Mil- na (50KN, 30 minutes). Also on the south side are other great beaches such as Zaraće, Dubovica, Lušišće and Sveta Nedelja/Ivan Dolac. Contact us for ad-venture activities such as sailing (half day 420KN), sea kayaking (half day 350KN), cycling (half day 500KN), hiking and rock climbing. There are 120km of hiking trails and 96km of marked biking trails within easy access of Hvar Town. Maps are on sale from travel agencies and Tisak stores. Hvar’s Summer Festival, which runs from late June to early September, includes classical concerts in the Franciscan monastery. Lavender Festival takes place in Velo Grablje village on the last weekend in June every year, with exhibits, concerts, wine tastings and a lavender fair – a fun local event.